Hachioji Castle (八王子城跡, hachioji joato) is one of the ruins of a castle located in Hachioji, Tokyo. Because the condition of the ruins of the castle is very well preserved, it is chosen as one of the 100 best castles of Japan. Hachioji Castle is categorized as a mountain castle. It was used to be the castle of Hojo family. It fell when the Odawara Castle fell by Hideyoshi Toyotomi. Many of Hojo people dod "Harakiri" at this castle. So, because of historical background, this castle is also well know as the haunted place. Otherwise, it is nice castle ruins for Hiking. There is parking space which close at 17:00. Restroom is also available. Hachioji Castle was built around 1584 to 1587 by Ujiteru Hojo. He was planing to build castle which easy to defense and hard to attack. However, it was fell by Uesugi and Maeda within one day. So, historian believe that the castle was never completed as Hojo planed. 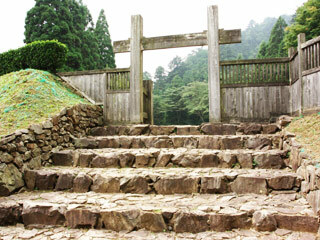 However, not like other mountain castle, Hachioji Castle uses many rock walls. So, if the castle was completed, it would be the one of the hardest castle to defeat. The shape of the castle preserved very well. You can still see how it was the strong castle. Only, Edo Castle and Hachioji Castle are chosen as the 100 best castles of Japan in Tokyo. Edo Castle which is currently the Imperial Palace now is the field castle which is more likely used as the symbol of the power and the house of Shogune. However, Hachioji Castle was the fort for battle. There are many trace that you can imagine what kind of battle plan Hojo was thinking. The mountain of Hachioji Castle is very old. In 913, one of the great monk meat Gyutotenno and eight princes when he was doing ascetic training. After that, he enshrined those 8 princes at this place. The name of "Hachioji" means eight princes. There is small waterfall right next to the residential area. When the castle fell, many people of Hojo family commit suicide. For three days and night, the color of the water becomes red with their blood. This story makes Hachioji Castle is also well know as one of the haunted castle in Tokyo. However, visit this castle at night is very dangerous. Be prepared well if you planing to do that. Now days, Hachioji Castle is great historic spot for hiking. Many people visit here and enjoy easy mountain hike.